Last week I made a Lemon Sunshine Cake for my Mum’s birthday since she loves all things lemony and sunny. My Pappo, on the other hand (whose birthday is this week), is a lover of dark chocolate and rich banana cream pie. 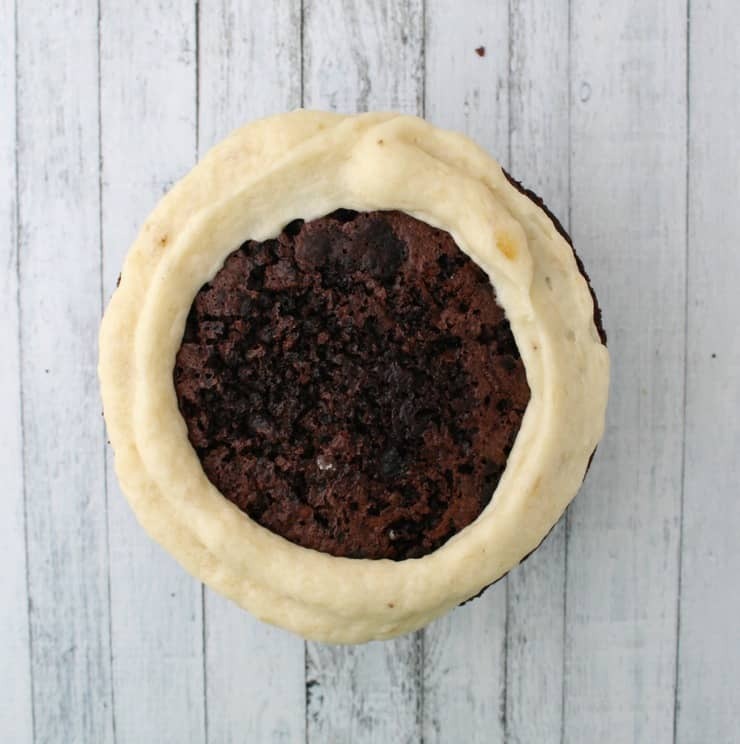 As you may have discovered from previous posts where I cover cakes in cookies, I’m not great at making dessert decisions (Why have cookies OR cake when you can have cookies AND cake?! ), so when it came time to decide whether to make a cake or pie, I decided to combine components of both! How, you ask? 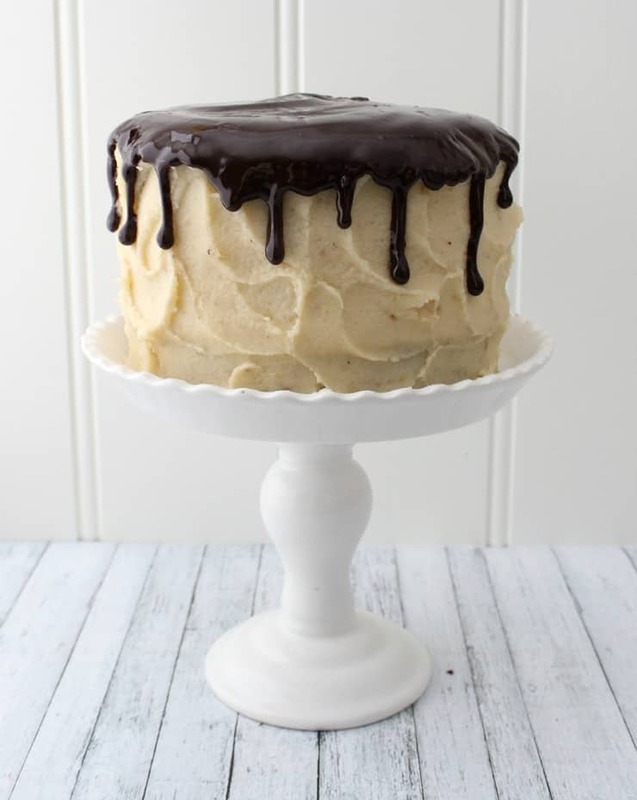 Think chocolate layers of cake filled with thin slices of fresh banana and rich vanilla pudding, covered with a banana buttercream frosting, and smothered in dark chocolate ganache. Happy birthday Pappo! I wish I could send you a slice of this cake! With this recipe, it’s easiest to start with the pudding since it needs the most time to chill. 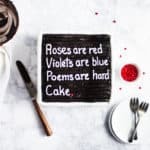 If you want to work ahead, you can easily make both the pudding and cake the day before and assemble it all the next day. To make the pudding, bring the milk, granulated sugar, and vanilla extract to a near boil in a small saucepan. In a small bowl, whisk together your egg yolks, flour, and corn starch. 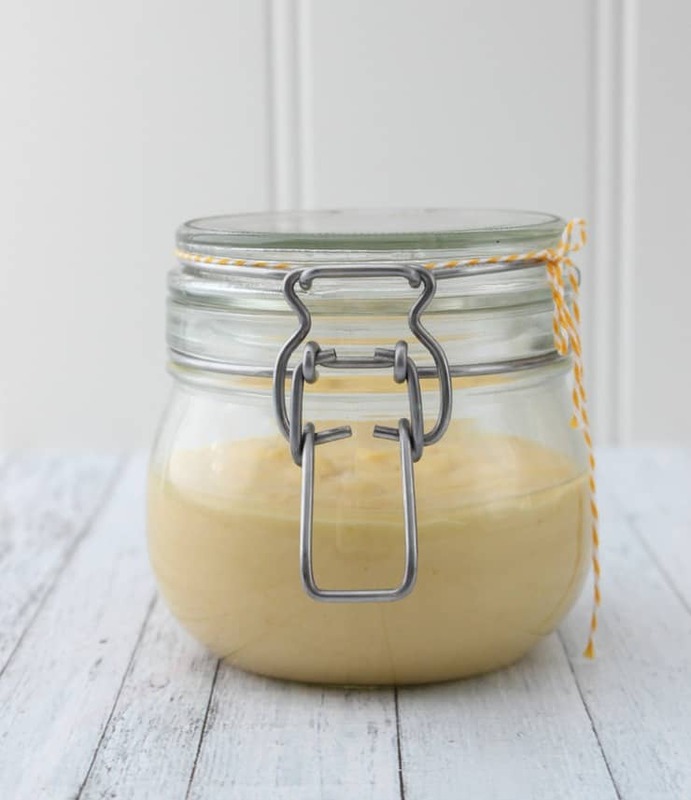 Once the milk mixture is hot, pour a little bit into your bowl with the egg yolk mixture, whisk it together, and then pour it all back into the saucepan, whisking continuously until everything is combined. Bring the pudding to a boil and continue cooking it until it becomes very thick (about 5-8 minutes). Remove the pudding from your heat source, whisk in the butter, cover it with plastic wrap, and set it aside in the refrigerator to firm up. To make the cake, begin by greasing and lining three 6″ cake pans. 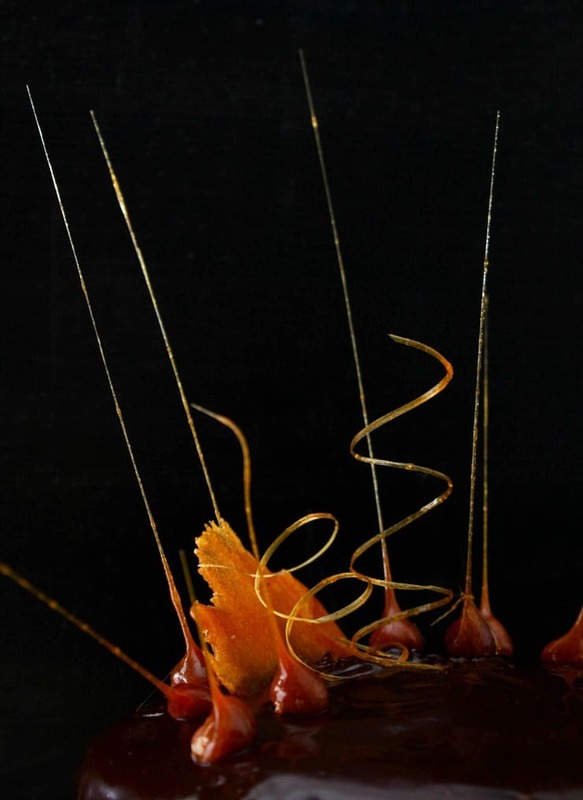 In a small bowl, whisk together your boiling water and dark chocolate until the chocolate is completely melted. Set this aside to cool down to room temperature in the refrigerator. In the bowl of a kitchen mixer, using the whisk attachment, whip your eggs until frothy and lightened in color. Add the oil and continue whisking until the mixture is light and fluffy. Whisk in the rest of your ingredients, including the cooled chocolate/water mixture, until everything is just combined. Divide your batter evenly between your three pans and bake at 350*F (175*C) for 30-35 minutes, or until a toothpick inserted in the center comes out clean. When you’re ready to assemble your cake, you can whip up your frosting. 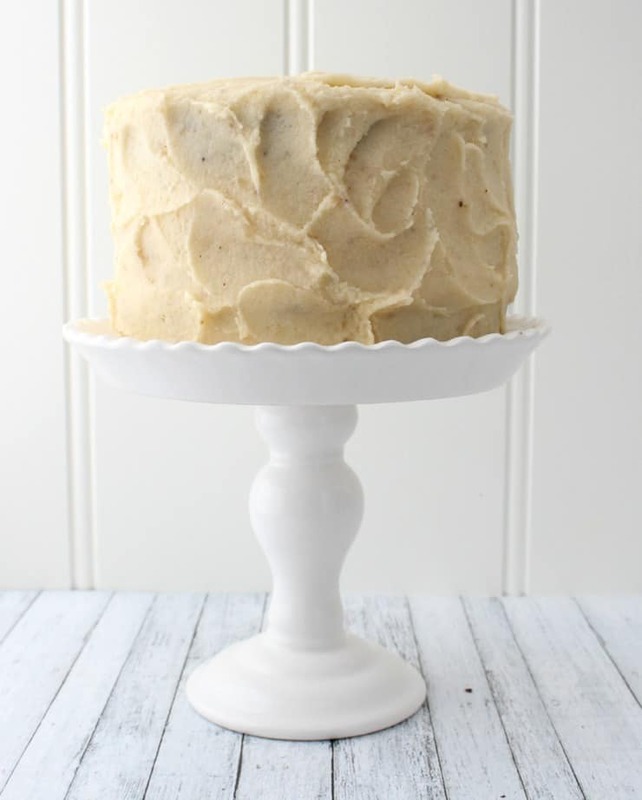 To make the frosting, break up your banana, and beat it on high in your mixer until smooth and lump free. Beat in the butter until smooth, then add your powdered sugar and beat until the frosting is smooth, light, and fluffy. 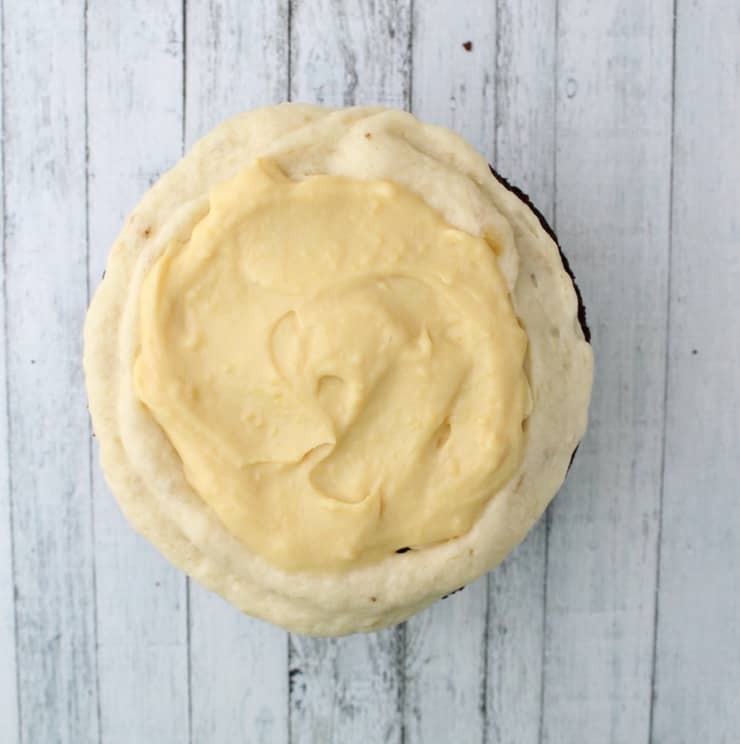 Because of the banana, the frosting can be a little soft, so if it’s too soft to work with, cover it and let it sit in the refrigerator until it’s firmed up. 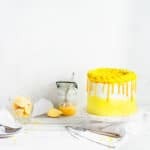 To assemble the cake, pipe a ring of frosting around the edge of your cake, fill the center with thin slices of bananas, cover the bananas with a thin layer of vanilla pudding, and cover with your second layer of cake. Repeat the same process to fill your second layer. Once the whole cake is assembled, give your cake a good crumb coat, and allow it to firm up in the refrigerator. Frost the cake however you’d like with the rest of the frosting (I chose a lightly textured frosting using my off-set spatula to create the texturing). 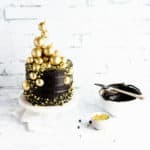 Before you make and use the ganache to top your cake, I recommend letting your cake set in your refrigerator for about 30 minutes. 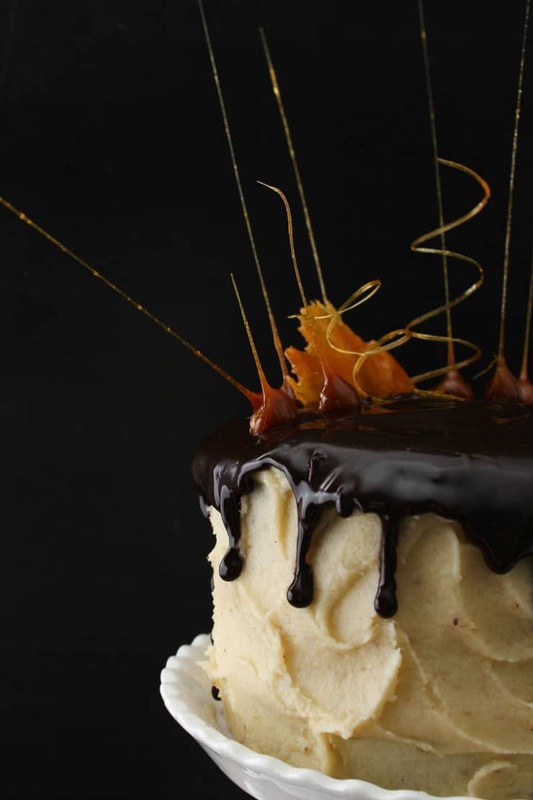 You want the frosting to be nice and cool so the ganache doesn’t move it around or melt it. To make the ganache, combine your heavy cream and chocolate in a microwave safe bowl, and heat in 20 second increments until the cream is hot and the chocolate begins to melt. Whisk the mixture until it’s smooth and glossy. 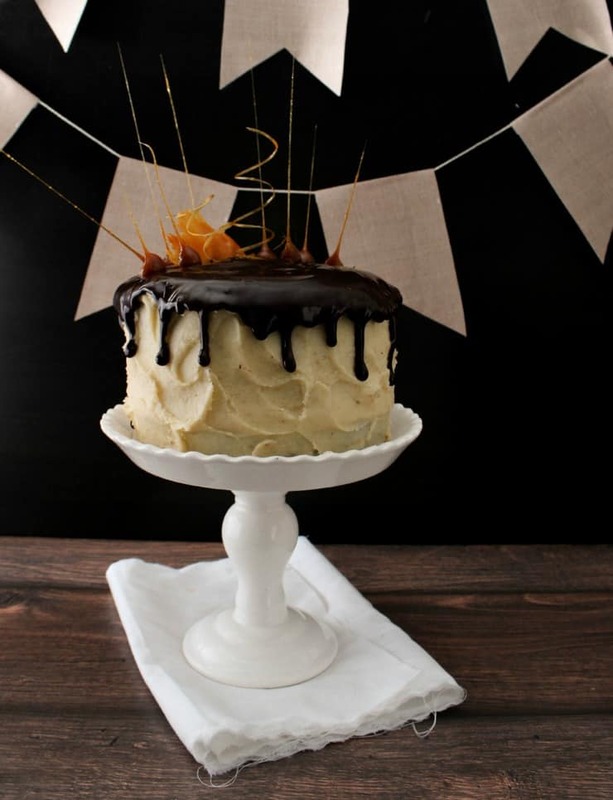 Let it cool down to room temperature before ladling the ganache onto the top of your cake. 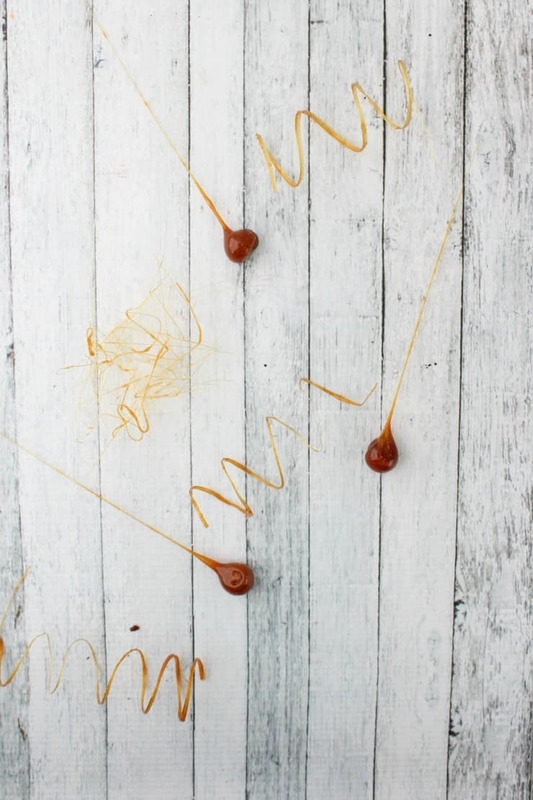 Garnish the cake (I used caramel dipped hazelnuts and caramel spirals) or serve it as is. 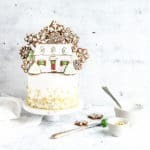 Seriously, this cake is a work of art. It’s beautiful. It looks good too! Awww thank you! 🙂 What a sweet thing to say! That is a real cake with lot of oomph, love it. Pining and tweeting. Wow this is gorgeous. I love the spirals – it’s such a nice texture contrast. 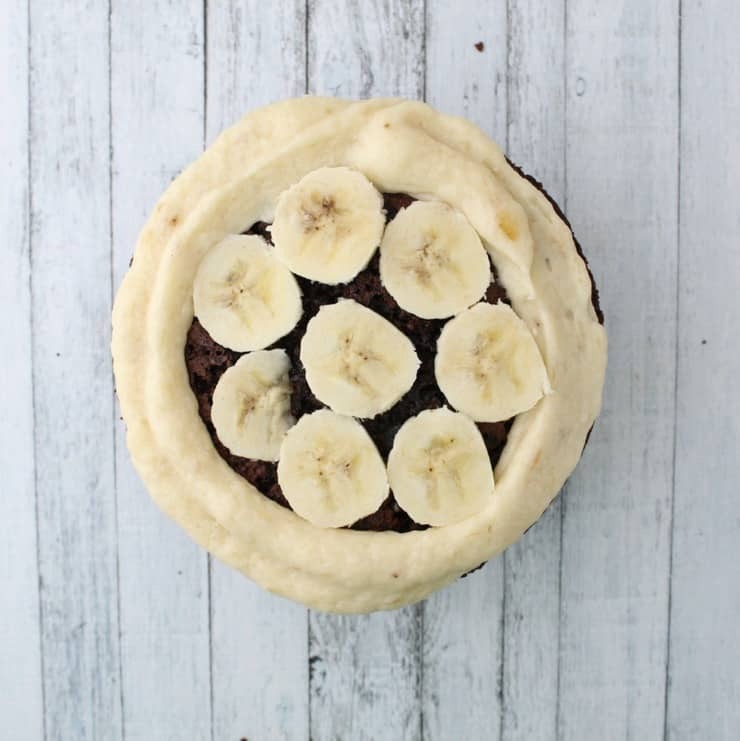 Chocolate banana cream pie cake is such a great combo – on my to do list! Thank you! Those spirals were definitely the hardest part of the cake, and it only took 5 batches of caramel to get it right! 😉 I think the trick is finding that perfect temperature where the caramel is just the right consistency. Thank you for the sweet comment! 🙂 The cake itself was fun to make, but I think I enjoyed playing around with the caramel accents the most. My husband has the same sort of logic (“It’s almost too pretty to eat, but that would be wasteful… pass me that plate!”). 😉 Thanks so much for hosting such a great link party each week!